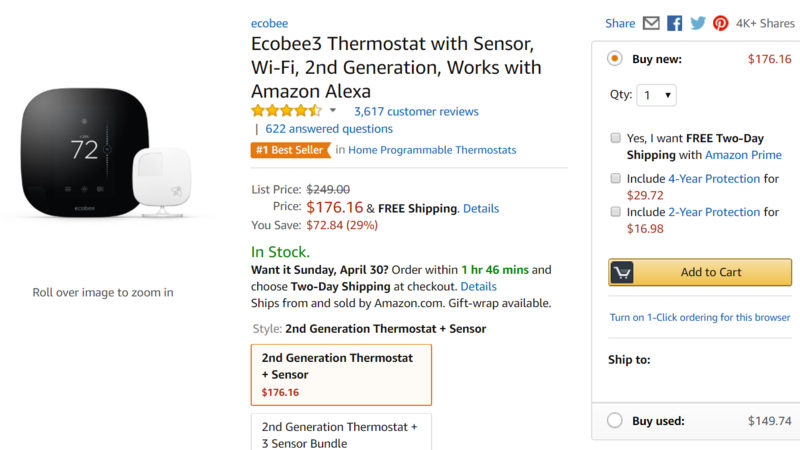 If you are interested in moving over to a smart thermostat system, the Ecobee3 is a pretty slick unit. It works with Amazon's Alexa if you've got hardware set up in your house for that ecosystem. It also has a bit more going on, visually speaking, than other devices like the Nest do; the screen on the unit itself is able to show you a lot of information, like weather forecasts and set schedules on-device. It's also able to determine via remote sensors if a room is occupied, adjusting levels as needed. We haven't reviewed it ourselves, but it is a highly regarded piece of tech. It doesn't work with Google Assistant or Google Home, but our own Corbin posted a few workarounds in the last post. If you've been eyeing one, $176 is the lowest we've seen. By Grabthar's hammer, what a savings.